Photograph collection of webmaster. 25234 date unknown at Crewe? The normal three hinged ventilators on the top row have been reduced to two for some reason. The twenty one year one month service life of D7584/25234 included a lengthy time allocated to Scottish Region depots as well as time at several London Midland Region depots. Final Class 25 to receive a Classified repair at Glasgow Works. February 1964 to Leicester (15A). January 1965 to London Midland (Midland) Lines. August 1973 to Springs Branch. Renumbered to February 16th 1974. 25234 was the 235th Class 25 withdrawn, one of two retired during February 1985. 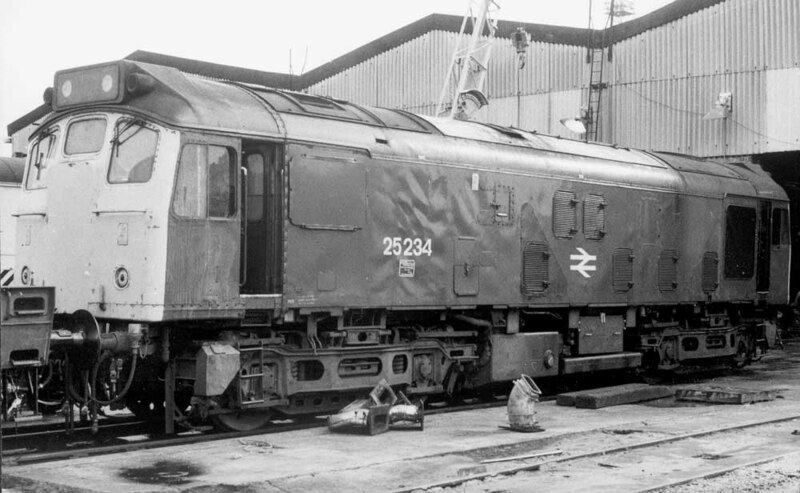 25234 had been sent to Derby Works in early November 1984 for repairs but these were not forthcoming. After storage at Derby, 25234 moved (see details below) to Swindon Works on July 24th 1985, but the Works closed before 25234 could be scrapped. It moved to Cocklebury Yard on May 26th 1987, to Hinksey Yard on June 2nd 1987 and into Vic Berry's, Leicester on June 11th 1987. 25234 was scrapped by the first week of July 1987 though the cabs remained a little longer. 25093, 25105/164, 25234/248/260, 25312/319 9X12 17.05 Derby Works - Swindon Works July 23rd 1985, hauled by 45060. 25027/75, 25123/133/144/158, 25228/234, 97202, 40046/63 Swindon Works – Cocklebury Yard, May 26th 1987. 25027/75, 25123/133/144/158, 25228/234, 97202, 40046/63 Cocklebury Yard – Vic Berry, Leicester June 2nd-11th, 1987, by 20019 & 20197 (Oxford – Leicester). Noted Derby Works February - March 1968. Noted Glasgow Works October 1975. Noted Glasgow Works January 1980 (N4 repairs). Noted Glasgow Works August - October 1980 (Intermediate repair). Noted Glasgow Works December 1980 (rectification). Noted Derby Works December 1984 to February 1985 (Power unit repairs, never completed). The continuing use of Sulzer 2s on the Aston ‘Condor’ service often found them pressed into service whilst laying over in Glasgow prior to the next evening’s southbound working. Often employed on local passenger workings, a popular choice being the 11.25 Wemyss Bay - Glasgow service with D7584 being noted in November (possibly 16th?). On June 25th 1969 D7584 worked the Glasgow - Edinburgh leg of an overnight working to Colchester, the details are a little sketchy on this working. Having been transferred to Eastfield during September 1967, 25234 would spend a huge chunk of its time on the Scottish Region, including allocations to all the Scottish Region depots associated with the Class 25s, 7584/25234 most likely travelled all the routes and services that were of a passenger carrying nature. Photograph courtesy Tony Sayer. 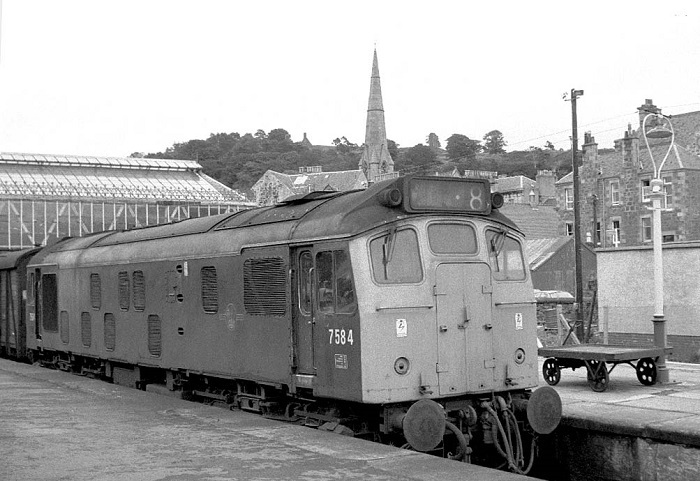 7584 at Oban on August 26th 1969. On June 20th 1970 7584 worked the 08.35 Glasgow Queen Street - Oban and the 12.25 return. On August 17th the 13.30 Glasgow Queen Street - Edinburgh push-pull service was worked by 7584 & 5408, 7584 was later noted banking one service out of Glasgow Queen Street whilst the next day 7584 was back on the Glasgow - Edinburgh push-pull high speed service with 5408. During August 7584 was transferred to Springs Branch, spending about eighteen months here before returning to the Scottish Region. Only one recorded passenger working has been noted whilst at Springs Branch; on October 19th 1974 a return motor show special from Euston to Barrow changed to diesel haulage at Lancaster with 25196 & 25234 taking over. During January 1975 25234 returned to the Scottish Region, now allocated to Haymarket. Thus followed seven and a half years on the Scottish Region allocated to three depots, of which the passenger workings recorded below probably reflect only a small portion of those actually worked. On March 20th 1976 the 13.10 Edinburgh - Inverness was worked throughout by 25234 & 25229. No doubt the Glasgow Queen Street - Dundee services were frequently handled, during 1977 only one has been recorded, the 07.38 Dundee - Glasgow Queen Street on July 25th. A diversion on September 22nd 1979 saw the 21.50 Euston - Mallaig run direct from Mossend Yard to Dunbarton (not calling at Glasgow Queen Street), unfortunately 25234 failed at Dunbarton. On December 10th 1979 25234 worked the 17.10 Perth - Arbroath. 25234 worked the 10.44 Glasgow Queen Street - Dundee and 13.39 return on October 22nd with 27014, and on October 29th with 25227 and on November 6th with 27014. The continuing shortage of locomotives, partly caused by a backlog of repairs at the main workshops, led to Swindon Works receiving unclassified repairs for locomotive types it had not dealt with before. On March 9th collision damaged 31124 & 31154 were moved from Doncaster to Swindon. Likewise 25191 and 25236 were also received for repairs. During March approximately six hundred locomotives were awaiting attention of which only one third (about 160) were out of traffic for scheduled repair. For the Class 25s fifty eight were laid up, the Class 31s had thirty out of traffic, whilst for the Class 47s one out of every five machines was awaiting some sort of attention. Eight Class 25s had been out of traffic for at least three months (25035/42, 25113/147/177/191, 25234/252), obviously the aforementioned move of 25191 to Swindon was a start in repairing these bad ordered machines. To provide Swindon with a source of spares 25111/147/252 were withdrawn during March and consigned there (25111 was the first to arrive on May 6th), interestingly two of these machines were in the batch long overdue for repairs. By month end 25188, 25218/221 had also been received by Swindon for repairs. 25218 had received a crushed cab in a shunting incident at Stonebridge Park on March 19th. Having broken up a vast number of hydraulics and Class 24s and with just 08006 & 08087 present for cutting a new chapter was about to begin with the arrival of these three condemned Type 2s. Unfortunately the plan for Swindon’s newly found repair work was affected by the worsening economy causing a nationwide cutbacks in repairs, with the existing repair shops unwilling to hand off a diminishing workload, especially now as some of BRs own depots were now carrying out more substantial repairs than previously. 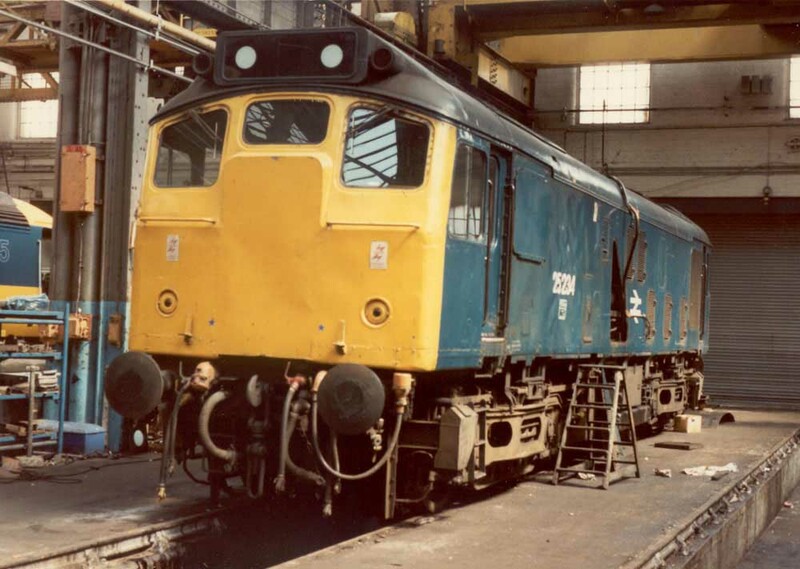 Maintenance for the Class 25s had like all other Types had been controlled by the TOPS system. A exams were at 55 hours, B exams at 275, C exams at 825, D exams at 1,650 and E exams at 4,950 hours. When the second E exam was due the locomotive would visit Derby or Glasgow for a classified repair. In laymans terms assuming a locomotive worked nine hours a day, for six days a week, it would reach its second E exam after about 3 1/2 years having undergone 179 examinations. TOPS hours are potentially misleading as many locos were left idling between duties causing a discrepancy between the hours run as logged by the TOPS computer and actual engine hours run up, be it under load or simply idling. For the class 25s these classified repairs (general or intermediate) would end in 1980, with a total of twenty seven completed in that final year, Derby outshopped seventeen, Glasgow handled ten. The last from Glasgow were 25234 intermediate October 1980, 25062 general June 1980 and the last from Derby were 25080 intermediate August 1980, 25278 general, released on January 23, 1981. Photograph courtesy Mike Cooper. 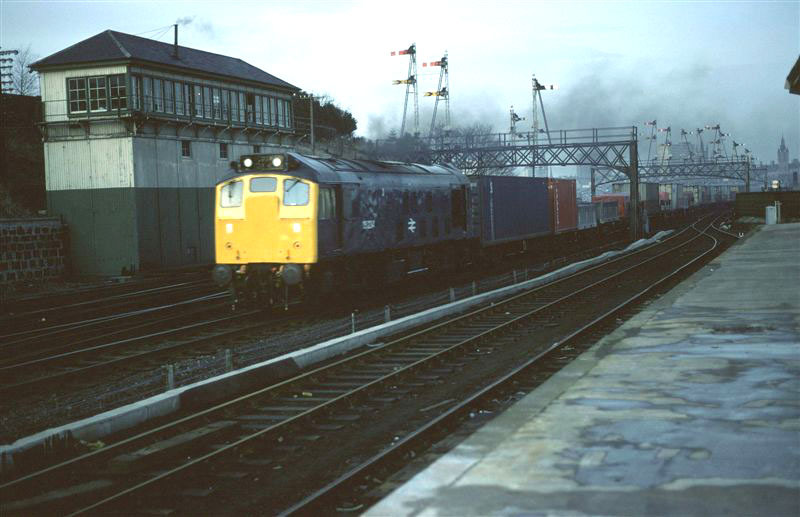 In February 1981 25234 is seen accelerating hard with a lengthy southbound Freightliner working, this was more normally in the hands of a Class 40 or 47. Today 25234 has a challenging run ahead. 1981 brought a varied mix of workings starting off with the 15.00 Edinburgh - Aberdeen from Dundee on March 5th after the Class 47 failed. On March 21st 25234 handled the 05.55 Stirling - Edinburgh. 25234 was noted on April 9th with the Keith - Inverness goods. The short 17.15 Dundee - Perth was worked on April 17th. A couple of workings in August and September indicate 25234 had strayed south of the border, working the 20.51 Barrow - Euston between Bletchley & Willesden on August 16th (or 23rd) due to the power being off for engineering works. A day excursion on September 6th saw the 08.20 Northampton - Aberystwyth worked between Nuneaton & Birmingham New Street where 25234 & 25201 were failed and replaced. By September 18th 25234 was back in Scotland working the 10.35 Stranraer Harbour - Kilmarnock and the 13.43 return. The 12.44 Glasgow Queen Street - Dundee and the 15.39 return were worked by 25234 on October 10th. December proved quite active for 25234. On December 3rd 25234 worked the 17.24 Edinburgh - Dundee and the 19.25 return. The next day (4th) 25234 was on the 18.20 Dundee - Edinburgh, followed by the next day's (5th) 04.35 Edinburgh - Glasgow Queen Street. December 9th was a busy day, starting off with the 08.44 Glasgow Queen Street - Dundee, returning with the 11.39 to Glasgow Queen Street. Then followed the 16.44 Glasgow Queen Street - Dundee and the 19.39 return, for a total this day of 342 passenger miles. The year ended with December 30th's 05.55 Stirling - Edinburgh and December 31st's 12.51 Edinburgh - Perth. On March 20th an Edinburgh - Stafford day excursion was worked Crewe - Stoke - Stafford by 25234 & 25034. On June 1st 25234 worked the 05.52 Stirling - Edinburgh. During October 25234 was transferred to Longsight though its Scottish workings were not quite finished. On November 5th a Crewe - Blackpool North was worked forward from Preston by 25234. 25234 was noted on September 8th attached to High Speed Recording coach 999550 at Clayhill carriage sidings. Possibly 25234's last recorded passenger working on the Scottish Region took place on January 6th with the 12.25 Edinburgh - Dundee. Photograph courtesy Jerry Glover. In the latter part of May 1983 25234 paid a brief visit to the Works, it is seen here on May 21st catching the light quite nicely. It would remain in service until February 1985. The remainder of the passenger workings for 1983 took place on the London Midland Region. On April 1st 25234 worked a Blackpool North - Manchester Victoria throughout. A rescue job on April 6th saw 25234 assist the relief 08.42 Blythe Bridge - Blackpool North as far as Preston after 47502 failed, at Preston 47268 took over. 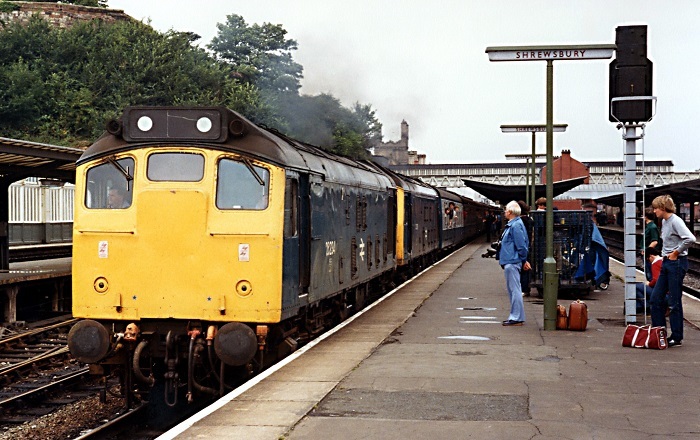 A missing diesel multiple unit saw 25234 and hauled stock work the 20.12 Preston - Barrow on July 14th (was this a Nottingham - Barrow service running about 20 minutes late?). A week later on July 20th 25234 worked the 06.45 Derby - Leicester and 07.48 Leicester - Leeds as far as Nottingham. The next day (21st) 25234 was noted southbound at Leicester with a cement train (ex-Syston?) of thirteen tankers. The final two passenger workings for 25234 were on the Cambrian line. On August 20th 25234 & 25229 worked the 10.10 Euston - Aberystwyth from Birmingham New Street, returning with the 17.15 Aberystwyth - Shrewsbury. And on September 3rd 25234 & 25119 worked the 07.35 Euston - Aberystwyth from Sutton Bridge Junction to Aberystwyth, returning with the 14.00 Aberystwyth - Rugby to Wolverhampton (train extended because of delays). Photograph courtesy Steve Morris. 25234 & 252229 at Shrewsbury on August 20th 1983 with a Cambrian Lines working. On August 26th 25234 was noted at Harbury hauling one six-car London Transport Underground stock, new from Washwood Heath? 25234 was noted at St Pancras on October 6th, on empty coaching stock (?) moves. 25202 & 25234 were noted working the 6Z97 Warsop to Stanlow oil tanks on March 29th. On April 24th 25234 was noted leaving Acton yard with a lengthy train of long wheelbase covered wagons. Class 25s noted on the Wednesday/Friday’s only early morning Garston – Forders brickliner during May included 25234 (23rd). On June 12th the 1E21 Plymouth - Leeds parcels was worked by 31296 (leading) & 25234. The 3V20 15.10 Manchester Red Star - Bristol Temple Meads was worked by 25234 on June 28th. On July 3rd the Ellesmere Port – Severn Tunnel Junction bitumen tanks were hauled by 25234 & 25190, the latter became a failure near Shrewsbury. 47352 on the following Bristol parcels switched with 25234 to take the heavier train forward. On July 3rd 25234 & 25196 were noted northbound at Crewe station with a Stanlow bound bogie oil train. As 1984 drew to a close Derby Works contained only two Class 25s under repair, 25037 with electrical problems and 25234 for power unit repairs. More serious (expensive?) problems were discovered later and the locomotive was withdrawn. 25234 was withdtawn on February 28th 1985. No.1 cab headcode panel: off-white panel fitted: at least by August 1979 until?. No.1 cab front: below driver's side front window: two large areas of missing paint: (not present July 1982), July 1983 until withdrawn. Page added July 5th 2013. Last updated July 28th 2018.